A beautiful story of determination, dedication and drive to fulfill one’s goals, even when those goals seem impossible to achieve, wrapped up in love for family and belief in self and others. Renni dreams of becoming a scribe, but his family is too poor to afford school. Renni’s father, Pentu, wants to give his son the education he craves; however, he has no job, and finding a way to earn the money proves nearly impossible for Pentu because he doesn’t have the strength required for most of the jobs in the city. After trying and failing at farming and fishing, Pentu returns home dejected, but Renni greets him each time with a reassuring hug. When he finally tries his hand at carving, Pentu is noticed by the local goldsmith who gives him a job. Pentu excels at making scarabs, a much-valued part of Egyptian culture. His favorite is a large, expensive lapis lazuli scarab, and Pentu knows that selling the jewel will give him the money needed to educate Renni for as long as he likes. When a traveling merchant finally buys the blue beetle, Renni will be able to make his dream come true. 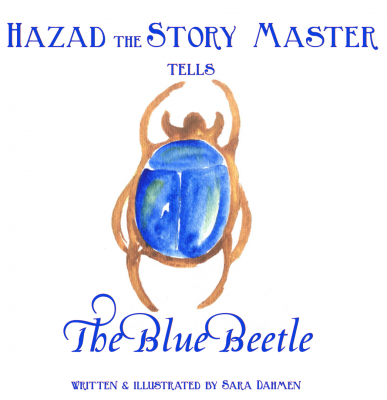 In this third volume of the Story Master series, Hazad, the storyteller, transports children to ancient Egypt where education is a privilege. With Pentu’s repetitive trials, this beautifully illustrated frame story is a bit like a cumulative tale. No matter how hard Pentu tries, he endures disappointment after disappointment; however, he never stops trying. His “never give up” attitude is inspiring. No matter the hardship, he will overcome anything to give his son the education he desires. The lesson about the value of education isn’t lost on the reader either. Children often undervalue the opportunity to learn while Renni yearns for only that, but even in the midst of Pentu’s disappointments, Renni remains positive. With every failure, he supports his father, reassuring Pentu of his love and never berating his father for being unsuccessful as he searches for his niche. In this celebration of artistry, The Blue Beetle will touch and inspire children to appreciate what they have, never stop trying regardless of the obstacles, and dream big. Sara Dahmen has worked in numerous facets in the publishing industry, including editing trade publications. Not only does she write children’s books, she also illustrates them and her historical fiction series, Flats Junction. However, publishing isn’t Sarah’s only talent. She is a copper and tinsmith apprentice, a wedding planner, and creator of her own cookware line. Throughout all of her many successful ventures, Sara cherishes life with her children and her husband.